This year’s application period has closed. We had 322 students apply and are currently reviewing applicants. We will email all intern applicants in April. Please see below for more information on our internships. One of the key objectives of ISB involves transferring knowledge gained through research to the community for the benefit of society. The Systems Education Experiences (SEE) program within the Baliga Lab meets and surpasses that objective through three different internship programs. One is based on the current research happening within the Baliga Lab and other ISB labs, the second is based on Project Feed 1010, and the third is based on our newest Systems Medicine education initiative. The application process for all positions is the same. Find more information below and on our Careers page. 8-Week Summer Internship for Rising Seniors In this internship, high school interns complete systems biology research and help develop hands-on instructional modules for students to use as part of their science curriculum. Specific Internship Information – Each January, Systems Education Experiences posts a job opportunity on the ISB careers website, enabling high school juniors to apply for a competitive, paid summer internship. This internship is very different than those typically found in research labs. 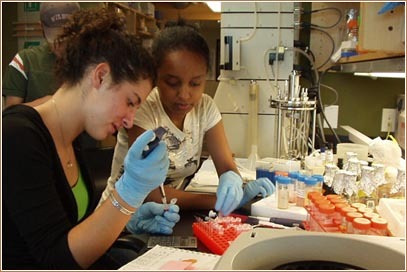 The systems biology approach allows students to work with many specialists, directly involving the students in a variety of projects, using many types of technology and techniques. Students gain valuable microbiology, engineering, and computational experience. Due to the unique nature of this curriculum building and research-based laboratory experience, students are highly engaged in creative problem solving as well as both independent and group learning. The internships are focused on bringing these key opportunities to students who typically would not have access to a professional work environment and a state-of-the-art research lab. To showcase their work and to document their experience, students learn from a skilled web designer to develop their own web pages. View the pages to learn more about what the interns do during their summer at ISB. If you are wondering what a standard day might be like for an intern, the 2012 interns put together a quick glance into a typical day at the end of their About Us page. Our 2014 interns also put together a page with information for applicants. For more student comments on the internship, please view this short video featuring our 2011 interns and the above-referenced video featuring one of our 2016 interns. Lastly, for general information and intern news items, see our ISB News Page and search using appropriate terms, such as “intern”. Please view this 3-minute video for more information on SEE and our 8-week internship. Project Feed 1010 Ambassador Program In this internship, high school interns complete systems biology and sustainable agriculture research during the summer. They also design and implement a way to bring this learning back to their school and/or community center during the year. Please see the Project Feed 1010 Ambassador pages for more information. In January through mid-March of each year you will be able to apply through our Careers page if interested. STEAM Towards a Healthier World Course This 90-hour modified internship, will kick off our first cohort of Systems Medicine Ambassadors. Apply as a 10th or 11th grade student for an interactive experience that weaves art into systems medicine. Learn how systems medicine is integrating science and technology to optimize current health and future wellness for individuals and communities. Please see the Systems Medicine Education page for more information. In January through mid-March of each year you will be able to apply through our Careers page if interested.